Tomorrow, 22 March, from 9am and 4pm, a stretch of Lankershim and Ventura boulevards will be closed to motorized traffic for CicLAvia – The Valley. At just 8.85 kilometers, it’s a short one… but considering this past Tuesday it took me 45 minutes on the 134 to get from Studio City to Burbank, it’ll still be a glimpse of what the Valley looks like without gridlock. CicLAvias are free, open streets events that briefly close off streets to motorized traffic —although I have seen people on mobility scooters and battery powered toy cars so the events aren’t completely free of motorists. There will be organized activities and food trucks but for me the real fun is seeing these communities without fear of being harried, harassed, or harmed by cars. Without a preceding definite article, “Valley” refers to the San Gabriel Valley in the names of many a business along Valley Boulevard. 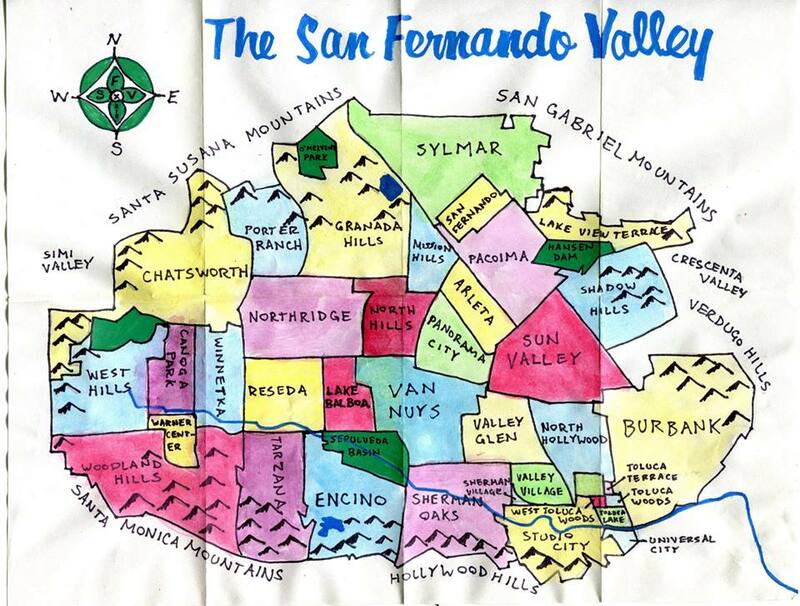 However, add that all-important “the” and “The Valley” is nearly always understood by Angelenos to refer to the San Fernando Valley. The choice of streets, Lankershim and Ventura, is interesting. Lankershim has long been an important thoroughfare, connecting as it does the Valley with the Los Angeles Basin below via Cahuenga Pass. Coldwater Canyon Boulevard, at the route’s western terminus, is another connection to the basin (in this case to Beverly Hills). The northern terminus, Chandler Boulevard, is named after Harry Chandler — the controversial publisher of the Los Angeles Times who also developed much of the San Fernando Valley. The main stretch of the route is Ventura Boulevard. 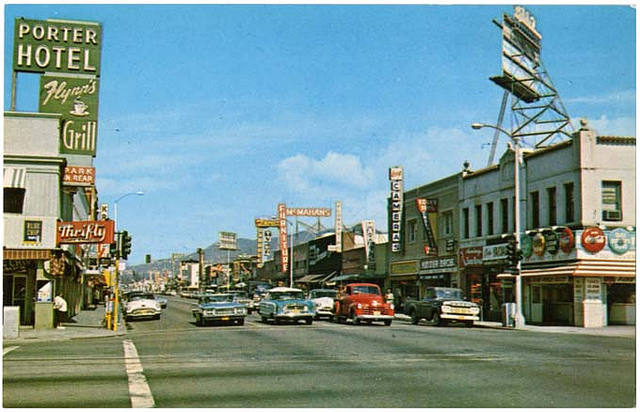 Ventura is the Valley’s “main street.” A section of it in Encino is billed as “The Valley’s Miracle Mile,” a reference to the museum-lined stretch of Los Angeles’s main street, Wilshire Boulevard. Today the Miracle Mile is rightly celebrated for its cultural institutions but was developed as a sort of linear, automobile-oriented commercial corridor. Ventura isn’t known for it’s high culture, although there is culture to be found in its restaurants, mid-century architecture, and long history. Ventura was used by Native Americans and later, after the Spanish Conquest, was developed as part of El Camino Real. Much later it was part of US 101 but although no longer a highway would (like Wilshire) benefit greatly from the addition of a rail line and without one remains stalled in the car-dependent 20th Century. Open streets events like CicLAvia — The Valley will hopefully inspire Valley-ites and visionaries to move things forward. The first people to have lived in the Valley were likely the ancestors of the Chumash, who arrived in the Los Angles area at least 13,000 years ago. Some 3,500 years ago the Tataviam and Tongva arrived, the presence of the latter still much in evidence in place names like “Cahuenga,” “Topanga,” and “Tujunga.” The Spanish built Mission San Fernando Rey de España in the Valley in 1797 and enslaved the locals whom they renamed “Fernandeños.” In 1821, Mexico gained independence from Spain and in 1833 the missions’ holdings were secularized. The land was again conquered by the US, who signed a peace treaty with Mexico near Universal City/Studio City Train Station. 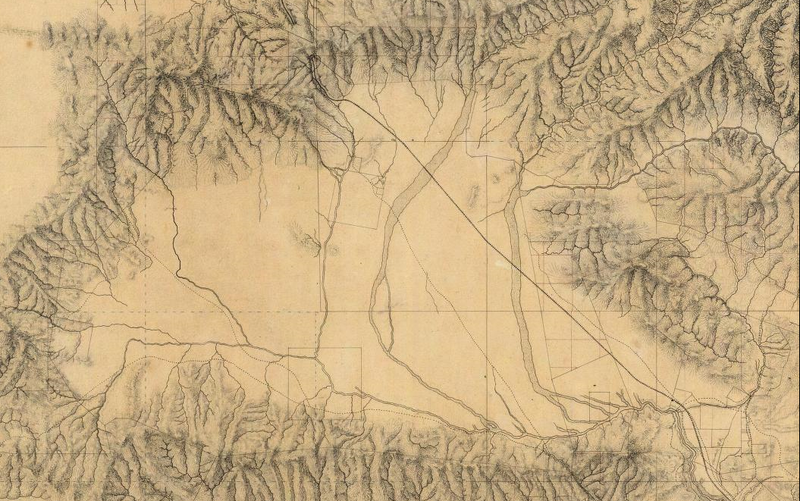 Rail arrived to the Valley in 1874 and early towns like Burbank, Owensmouth, San Fernando, and Van Nuys sprang up. Most of the Valley was annexed by Los Angeles in 1915. One year earlier, German-American filmmaker Carl Laemmle began construction on the Valley’s first permanent movie-making facility, Oak Ridge Ranch, which later became Universal City. Although tourists still follow their noses to Hollywood, beginning in the 1920s, most of that district’s movie studios, prop shops, and production houses moved over the Santa Monica Mountains to the Valley. Later the Valley would be famous for producing it’s own studios, although Vivid and Wicked are unlikely to show up on any movie tours or lists of the Valley’s cultural contributions, which also include Gelson’s Markets, Du-par’s Restaurants, and (my favorite), the Los Angeles River. The Los Angeles River begins in Canoga Park at the confluence of Arroyo Calabasas and Bell Creek. It’s joined by Browns Canyon Wash in Winnetka and Aliso Creek in Reseda before it enters Sepulveda Basin where it’s additionally joined by Bull, Encino, Haskell, and Woodley creeks. After it flows out of the basin, in Sherman Oaks, its course takes it nearer Ventura Boulevard but after meeting the Tujunga Wash, it again strays from Ventura, flowing around Griffith Park and continuing its 82 kilometer course to the San Pedro Bay. A watershed moment came for the concretized river in 2010, when it’s navigability was demonstrated by kayakers and paving the way for its un-pavement. For those who prefer to explore without getting wet (or giardia) there are river trails including the North Valleyheart Riverwalk and The Los Angeles River Bike Path, which in 2016 are scheduled to be joined by a section known as the Zev Yaroslavsky LA River Greenway Trail. During the early years of the Cold War, the Valley emerged as an important center of aerospace and defense and most of it was covered with suburban development. In the 1980s, it still had the reputation as Los Angeles’s suburb, and the suburban valley girl was lampooned in Frank Zappa’s 1982 single, “Valley Girl” and celebrated in Martha Coolidge’s 1983 film, Valley Girl. Preserved by music and film the stereotype never changed although the Valley itself did. Even as valley girls were influencing the way young people talked around the country, the Valley was undergoing significant Latinization and urbanization. 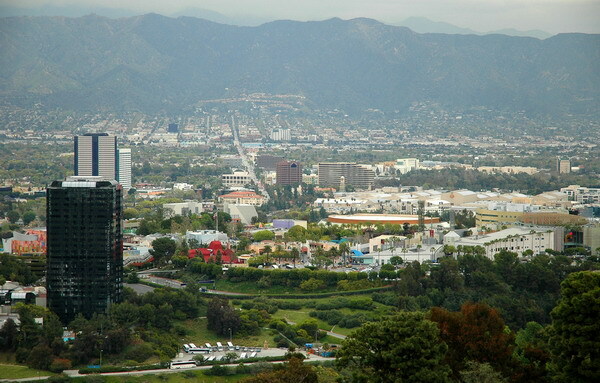 Today the Valley includes clusters of high-rises in Burbank, Encino, Studio City, Universal City, and the “Century City of the Valley,” Warner Center and Anglos are outnumbered by Latinos. The Valley is diverse too — with significant numbers of Armenians, English, Filipinos, Germans, Irish, Italians, Jews, Koreans, Palestinians, Persians, and Russians. It’s important to remind readers and participants that open streets events are not races. There are no start or finish lines. If ciclovias sometimes resemble marathons it is because they take place on streets and are thus linear. However, they’re most rewarding when explored at a measured pace and with an adventuresome spirit. I’m starting in North Hollywood rather than at the other end because that terminus is a major public transit hub, served by Metro’s Orange and Red lines as well as Metro Local 152, 154, 156, 162, 183, 224, 353, and 656 lines; the Bob Hope Airport Shuttle; Burbank Bus’s NoHo-Media District and NoHo-Empire lines; California Shuttle Bus’s San Francisco/San Jose line; City of Santa Clarita Transit’s 757 line; and LADOT Commuter Express’s 549 line. It’s also located near the eastern end of the Metro Orange Line bicycle path. 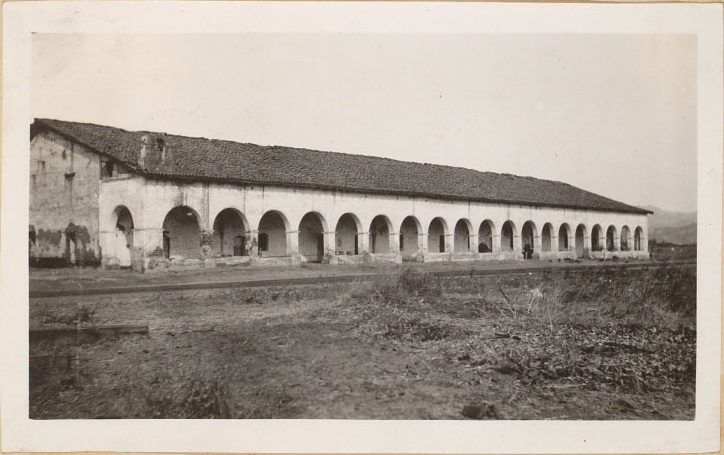 The subway station opened in 2000, near the site of the old and recently-renovated Toluca Southern Pacific Depot, a train station built in 1896 that was built by Southern Pacific and additionally served by the inter-urban Pacific Electric Railway until 1952. Today it is one of the few remaining 19th century buildings in the Valley. 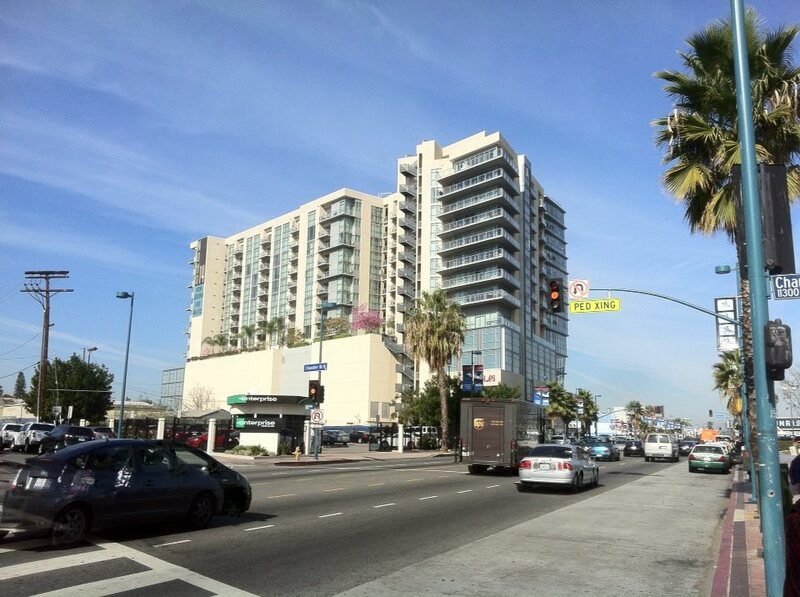 Also near the station is NoHo 14, the tallest residential highrise in the Valley. One of the first high-rises in the Valley was the Mid-Century modern Commonwealth Savings Building, built in 1961 but sadly demolished in 2013. Older and still standing not far from the ciclovia route is Valley Plaza Tower (12160 Victory Boulevard), a ten-story Corporate International-style building completed in 1960 and designed by prominent local architects Douglas Honnold and John Rex. In 1979 the Community Redevelopment Agency adopted a part of North Hollywood for redevelopment most of which was designated the NoHo Arts District in 1992. 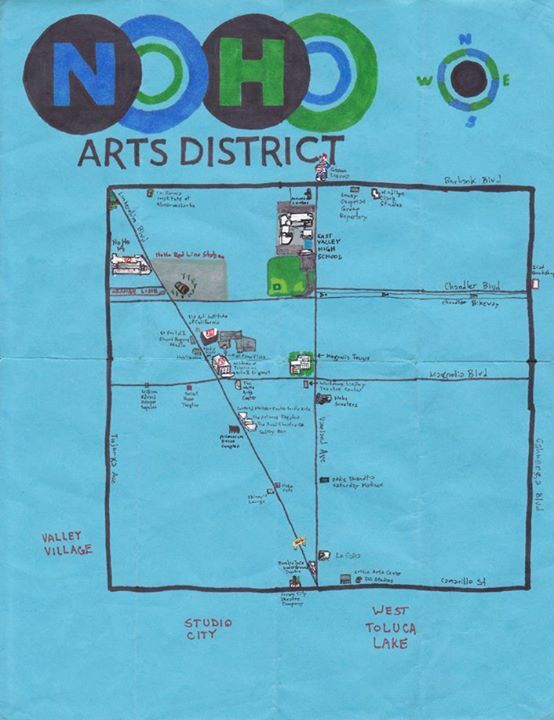 The NoHo Arts District today is undoubtedly the cultural capital of the San Fernando Valley. 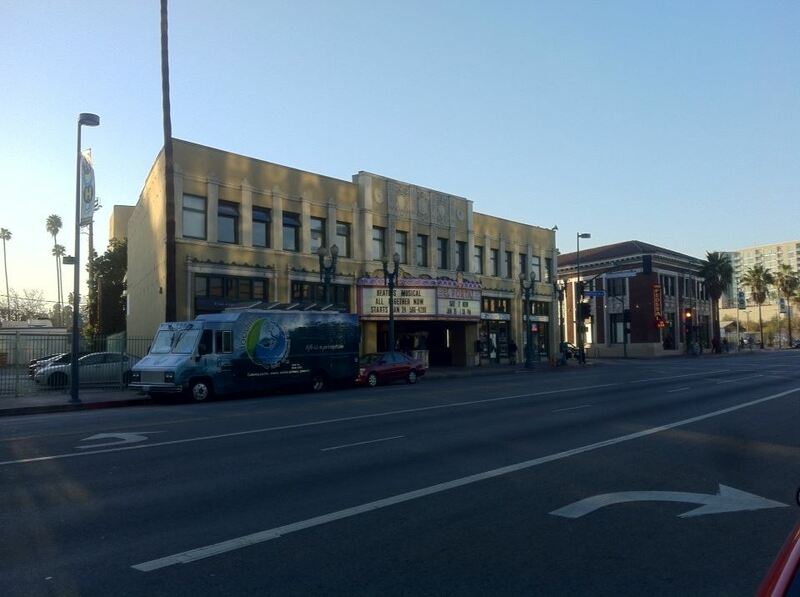 The area, along with the Hollywood Studio District, is one of Los Angeles’s major concentrations of live theater. It’s also home to a large number of art galleries, dance studios, and café. Other North Hollywood sites worth a gander include North Hollywood Park (established in 1927 and which hosts the Dave Potell Memorial Rink, the North Hollywood Skate Plaza, a swimming pool, and the North Hollywood Regional Library), the iconic Circus Liquor sign (as seen in Murder Was the Case and Clueless), the North Hollywood Post Office (constructed in 1936), the Television Academy (whose collection of sculptures including Bea Arthur, Bob Newhart, and Gene Roddenberry is far more interesting than Hollywood’s Walk of Fame), the El Portal Theatre (built in 1926), Eddie Brandt’s Saturday Matinee (a great video rental place — including VHS), the Iliad Bookshop, the Federal Bar, the California Institute of Abnormal Arts (a bizarre freakshow/performance venue), the restored Idle Hour (a whiskey barrel-shaped bit of programmatic architecture which opened in 1941), the North Hollywood Masonic Lodge (designed by Mayan Revivalist British architect Robert Stacy-Judd), Le Petit Chateau, the St.Charles Borromeo Church (which although built in 1938 obtained a nice J. Earl Trudeau-designed Churrigueresque façade in 1959), Weddington Park, Phil’s Diner (built to look like a train car and not currently in operation), the Lankershim Arts Center (designed by S. Charles Lee in 1939 for the Los Angeles Department of Water & Power), and North Hollywood Toyota (a Streamline Modern car dealership from 1940). If Encino Commons is the Valley’s Miracle Mile, Toluca Lake is the Valley’s Yugoslavia. In a region known for neighborhoods renaming themselves and redrawing their borders, Toluca Lake takes the balkan cake, chopped up into the small communities of Toluca Lake, Toluca Terrace, Toluca Woods, and West Toluca Lake. They all have roots in the historic Toluca Ranch, a portion of which is now located within the city of Burbank. As for the titular lake, it’s private and protected by the Toluca Lake Property Owners Association, who are the Valley’s Securitate so don’t attempt to visit. Aside from the popular eatery, Little Toni’s, I’m not aware of much that would warrant leaving the ciclovia’s course. Do consider Universal City, although isn’t a city in any recognizable sense since it’s not incorporated and has no permanent residents. Like a proper city, it does have a couple of tall buildings, the tallest being the 36-story 10 Universal City Plaza (completed in 1984) and the rest including Hilton Universal City & Towers (1989), Sheraton Universal Hotel (1969), and Universal Studios Tower. It also has the illusion of a downtown, the mall-like simulacra that is Universal CityWalk. For tourists its probably best known for being the home of Universal Studios Hollywood, a theme park that is, of course, not located in Hollywood. If you like theme parks — and it’s fun to tour the backlot — it’s worth a visit. 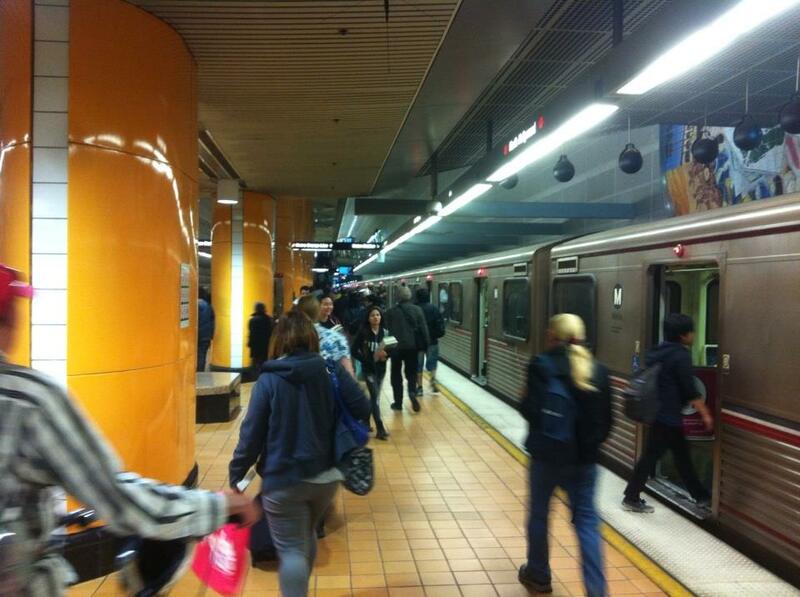 Located between Universal City and Studio City is Universal City/Studio City Station. When it opened it was the first subway station in the Valley. During its construction, the foundation of the late 18th century Campo de Cahuenga Adobe (where the Treaty of Cahuenga/Guadalupe Hidalgo was signed) was uncovered just 15 centimeters beneath a sidewalk along Lankershim where it had been since it was demolished in 1900. A recreation was built nearby in 1951. 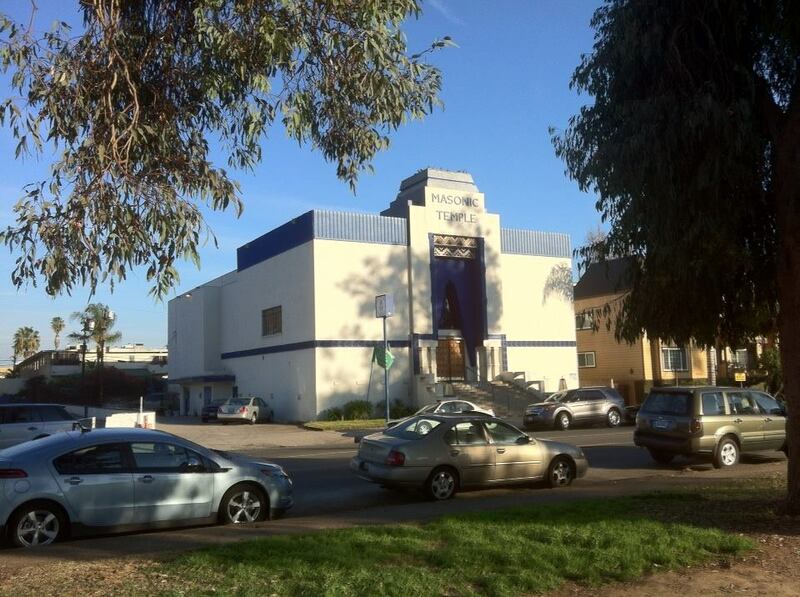 Like Universal City, Studio City also began with a film studio, in this case Mack Sennett’s Studioland, which began operation in what was then known as Laurelwood in 1927. Also like Universal City, Studio City is a city in name only although it does have residents and is part of the city of Los Angeles. In 1933, Studioland became Mascot Studios which in 1935 became Republic Studios. In 1967 it became CBS Studio Center and was used to film Gilligan’s Island and Yes, Dear. Other Studio City sites worth a look include the J. Barry Moffitt-designed Waxman House (built in 1964), R.M. Schindler’s Lingenbrink Shops (a 1942 strip mall with additions from 1946), Schindler’s Laurelwood Apartments (a courtyard complex built in 1949), Oil Can Harry’s (a gay bar which opened in 1968), Du-Par’s Restaurant, the historic Fox Studio City Theatre (built in 1939 and currently home to a Barnes & Noble), the Studio City Hand Car Wash (which has a large, helpfully-illustrative hand sculpture), Art’s Delicatessen (in operation since 1957), a Late Modern style Ralph’s (formerly a Hughe’s and designed by Tarzana-based R. Leon Edgar in 1972), a former Denny’s (designed by Armet & Davis, the duo responsible for Googie style Norm’s on La Cienega and Pann’s on La Tijera), St. Michael and All Angels Episcopal Church (a 1962 Mid-Century Modern church designed by A. Quincy Jones and Frederick Emmons), The Fox and Hounds (a British Pub), Pinz Bowling Center (formerly Kirkwood Bowl, a 1956 bowling alley), and the Sportmen’s Lodge, a natural area which gradually was developed into the Studio City landmark that it is today. If you want more guides, Andrea Richards, Daniel Larusso, and the Militant Angeleno have published their own. 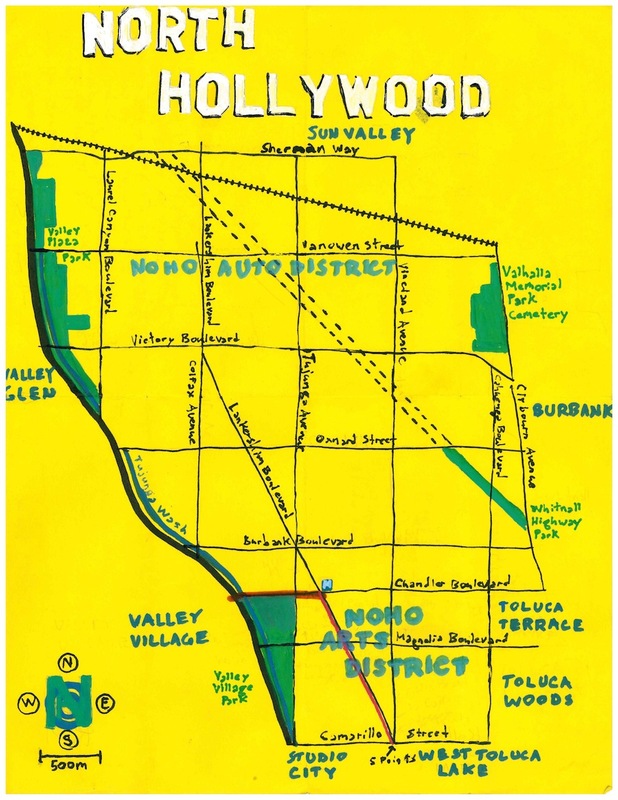 Also worth checking out are Lindsay William-Ross’s Neighborhood Project: NoHo Arts District, Colin Marshall’s A Los Angeles Primer: Universal City, and my own California Fool’s Gold — Exploring North Hollywood, The Gateway to the Valley. Eric Brightwell is an adventurer, writer, rambler, explorer, cartographer, and guerrilla gardener who is always seeking writing, speaking, traveling, and art opportunities. He is not interested in writing advertorials, clickbait, or listicles and jobs must pay offer reasonable pay. Brightwell’s written work has appeared in Amoeblog, diaCRITICS, and KCET Departures. His work has been featured by the American Institute of Architects, the Architecture & Design Museum, the Craft & Folk Art Museum, Form Follows Function, Los Angeles County Store, Skid Row Housing Trust, and 1650 Gallery. Brightwell has been featured in the Los Angeles Times, Huffington Post, Los Angeles Magazine, LAist, Eastsider LA, Boing Boing, Los Angeles, I’m Yours, and on Notebook on Cities and Culture. He has been a guest speaker on KCRW‘s Which Way, LA? and at Emerson College. Art prints of his maps are available from 1650 Gallery and on other products from Cal31. He is currently writing a book about Los Angeles and you can follow him on Facebook, Instagram, and Twitter.